How much to Budget for 2 Weeks in Cuba and Mexico (Yucatán)? German Version: Was kosten 2 Wochen auf Kuba und in Mexiko (Yucatán)? 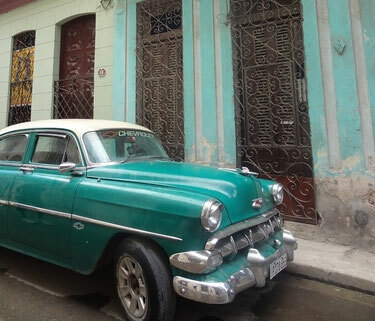 Cuba and Mexico are the perfect combination for a great itinerary. In only 2 weeks you can explore the highlights around Havana and of the half island Yucatan. A few days relaxing at the beach are the perfect ending of your trip. To give you an idea, how much to budget for 2 weeks in Cuba and Mexico during summer (July / August), I listed all expenses we (2 people) had during our combitrip. Direct flights from Germany to Havana and from Cancun back to Germany cost about 790€ in July / August 2019. 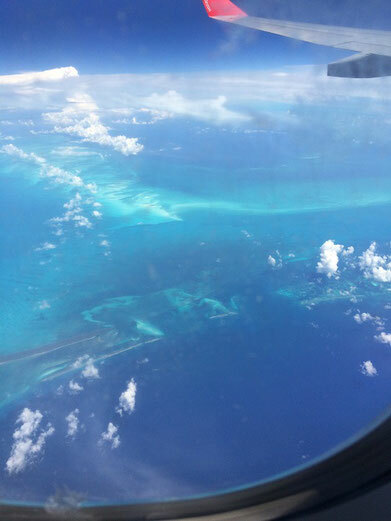 Flights from Cuba to Mexico with the airline Aeromexiko cost approx. 110€. There is also another airline called Interjet which also operates flights from Havana to Cancun but our travel agency recommended not to fly with this airline due to safety reasons. Costs are approx. the the same and therefore we booked the flights with Aeromexico. To enter Cuba you need a valid passport for at least 6 months, an overseas health insurance which is valid for Cuba and a so called tourist card. With this "card" you can stay in the country for up to 30 days as a tourist. It can be extended once for another 30 days if necessary. The tourist card must be bought before entering the country. It is possible to buy one from the Cuban embassy, from some airlines at the airport, from some travel agencies or online. The costs are approx. 30€ depending on where you want to buy it. 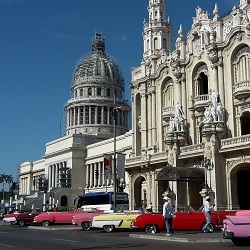 More information about what you need to know before travelling to Cuba can be found in this blog post: Things you must know before travelling to Cuba. We decided to stay in a so called Casa Particular. A Casa Particular is a private accommodation, like AirBnB. You live with a Cuban family. Our casa "La Casa de Candida" was great. Our room which included a bathroom was nice, furnished with the bare necessities and very clean. 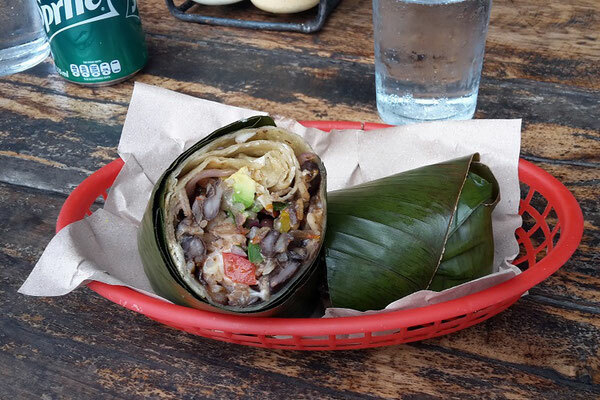 The location is great not only because it is close to Havana´s old town Habana Vieja but also close to the famous promenade Malecon and the Callejon de Hamel, a colorful artistically designed street, where once a week a small Afro-Cuban festival takes place. Moreover, one of the best private restaurants of the city "Paladar San Cristobal" is only one block away. The owner of this Casa Particular was super nice. and we had super delicious breakfast and dinner there. The only small negative aspect: Cuba is really hot and also at night the temperatures won´t go down significantly. Thus also the room was very hot. There was an air-condition and a ventilator but both was extremely loud. 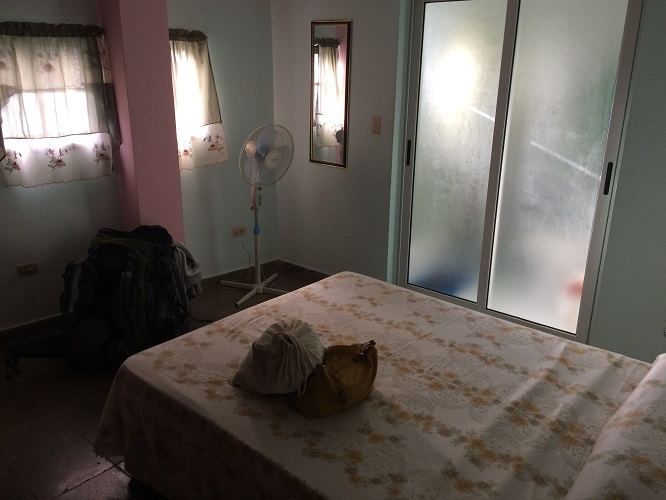 One night in the Cuban Casa in the center of Havana costs only 25€ for one room which makes 125€ for 5 nights. 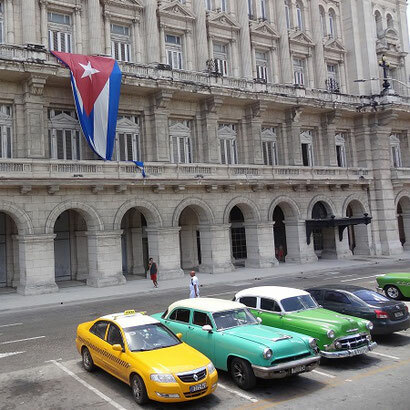 We decided to book an accommodation in the city center of Havana to explore the city on foot. Thus, we saved a lot of money for taxis, busses or other public transport. Most tourist attractions are located within the old town. From our casa to Habana Vieja (old town) it was just a short 10 minutes´ walk. 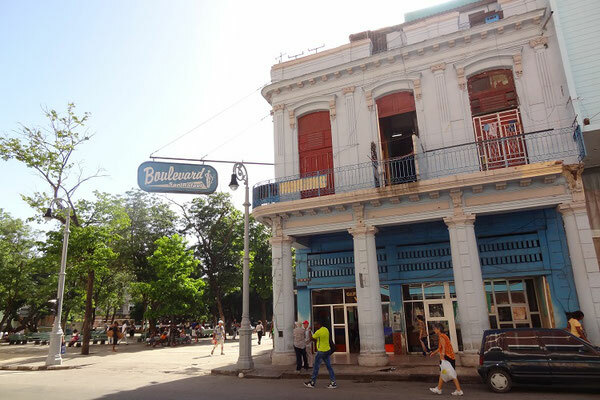 More information about the old town: A walk through Havana´s old town, Habana Vieja. Tourist attractions which are not located in the old town can be reached with the Hop On Hop Off Bus (costs 10€). There are two routes. One is for the famous tourist attractions and one for the beach. For more information read this blog post: Hop On Hop Off Bustour in Havana. Only one time, additionally to the transfer from and to the airport, we took a taxi to go to Castillo de los Tres Reyes del Morro. The fort offers a fantastic view over Havana. We took a taxi because it is not easy to go there without a car and of course we wanted to do at least one ride in a typical vinatge car. The food offered by our Casa Particular was super delicious. For breakfast we had different fresh fruits, cheese or ham sandwiches, eggs, bread with jam and coffee or tea. 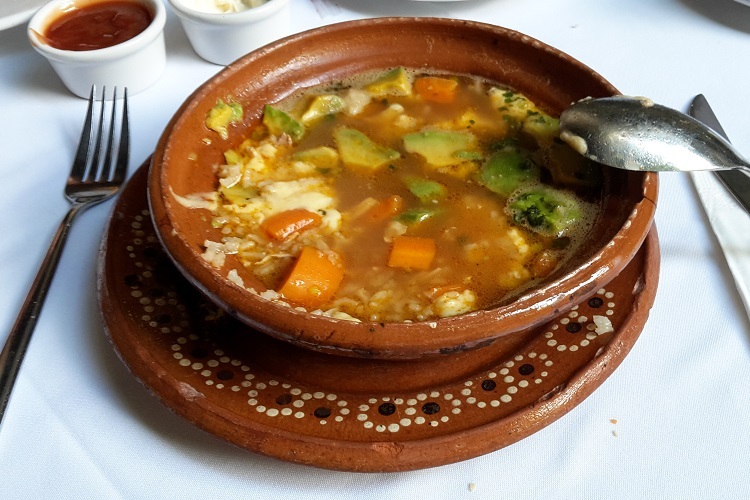 For dinner we could choose between beef, chicken or fish which was served with rice, beans, avocado, backed bananas, salad, a vegetable soup and soft drinks or beer. 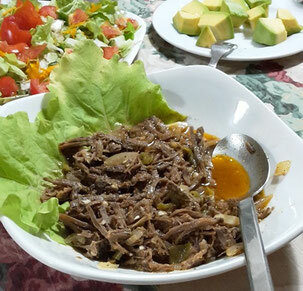 We both loved the Cuban national dish Vieja Ropa which is pulled beef. The costs for breakfast were 4€ and for dinner 10€ per person. 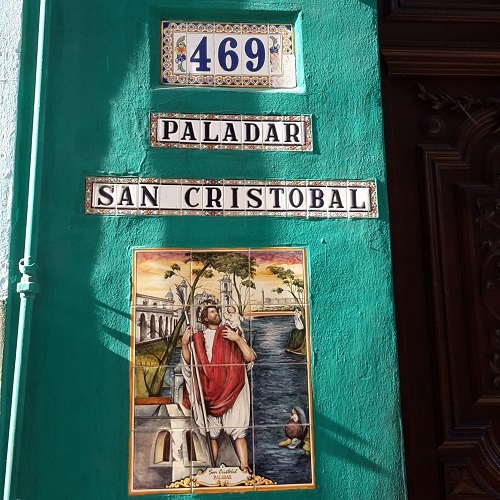 One night we decided not to eat "at home" but in the private restaurant Paladar San Cristobal. 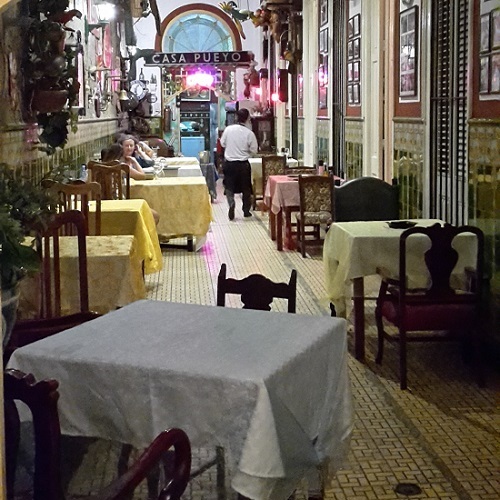 Also Barack Obama had dinner here when visiting Cuba. The food was super delicious and the costs low: two main dishes plus drinks approx. 25€ plus a 7 years old Rum and a Cuban cigar for free. Apart from that we went out for drinks at night. During the day we just had a lot of water due to the heat. 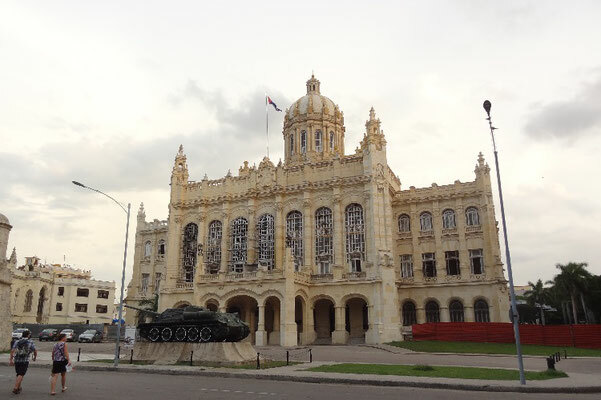 It was not necessary to spend a lot of money for attractions because the streets and squares of Havana already are tourist attractions free of charge. We just visited the museum of revolution and the largest cemetery of America. Both spots are highly recommendable. Other interesting tourist attractions in Havana can be found here: Top 15 Tourist Attractions in Havana. A day trip to Vinales Valley is great when being in Havana. The valley is one of the greatest natural beauties of Cuba and only 2 hours away. We booked the tour in the Hotel Inglaterra at Parque Central. The trip included a stop at a viewing platform, which offered a fantastic view over the valley, a stop at Mural de la Prehistoria, a huge colorful rock, lunch, a visit of a cave, Cueva del Indio and a visit of a tobacco grower. More information about the tour can be found in this post: Viñales Valley - one of the greatest natural beauties of Cuba. 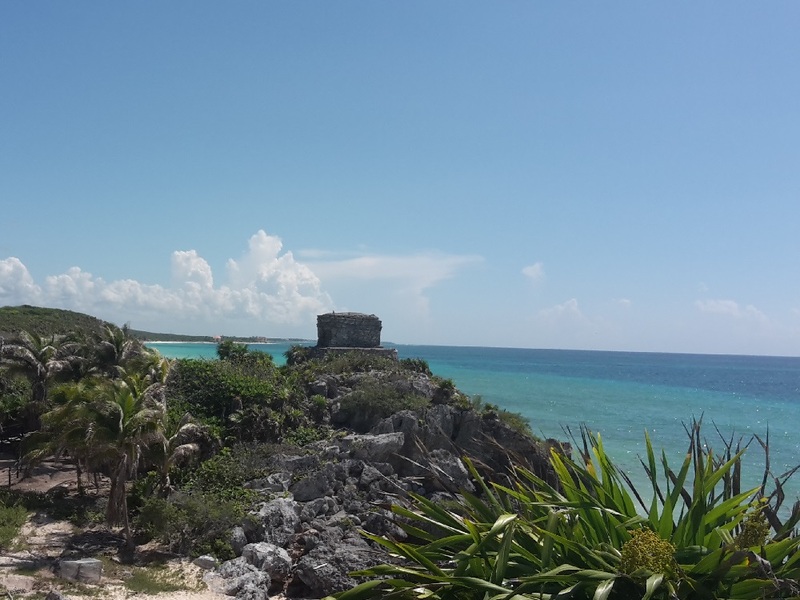 In Mexico the following 7 cities / Island can be combined perfectly with each other: Tulum, Valladolid, Ek Balam, Chichén Itzá, the capital of Yucatan Mérida, Cancun and Isla Mujeres. Hotels in Mexico were more expensive than our Casa at Cuba. The average costs for one room in Tulum, Valladolid and Merida were 61€. All three hotels were very nice, clean and above all located in the city center. At the end of our trip we wanted to relax at the beach for 3.5 days. Therefore we booked an all-inclusive hotel in the hotel zone of Cancun. This was the most expensive part of our trip. If you want to save money, I would recommend booking a "normal" hotel in Tulum and not an all-inclusive hotel in the hotel zone. Mexico has an excellent extended bus network and we only had to take a taxi / collectivo a few times. The so called ADO busses connect the most important cities with each other and are super cheap. The cheapest ticket we bought was only 1€. The most expensive one was 20€ for more than 300 kilometers and an approx. 5 hours journey. There are first and second class busses. For long-distance journeys I would recommend a first class bus because it is faster and more comfortable. Who wants to take a taxi should always look for an official one and negotiate the price in advance or ask to turn on the taximeter. When going from the ADO station in Cancun to the hotels in the hotel zone there are fixed prices. All taxi drivers have an official list showing every single fare to the different hotel in the hotel zone of Cancun. In total we didn´t spend a lot of money for tourist attractions. 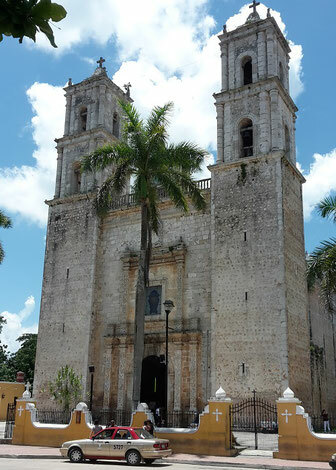 In Mexico we visited the Colonial cities Valladolid and Mérida. The city centers are well worth seeing also without visiting any fee-based tourist attraction. Also the Cenote in Valladolid was free of charge although I read something else on the internet. The Mayan ruins in Tulum, Chichén Itzá and Ek Balam are of course not free of charge. Chichén Itzá and Tulum are in my opinion must-see spots when being in Yucatan. The world famous ruins Chichén Itzá are a lot larger than the once in Tulum and there are more and better preserved buildings. But the Mayan ruins in Tulum are the only once located directly by the sea. The ruins in Ek Balam have the great advantage that you can climb some buildings. 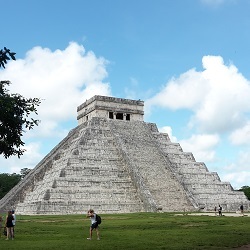 More information about the Mayan ruins in Tulum and Chichén Itzá can be found here: "The Mayan Ruins of Tulum" and "Chichén Itzá - amazing Mayan Culture". 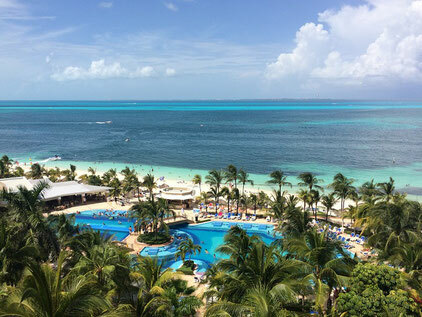 While staying in the all-inclusive hotel in Cancun there were no extra costs for food and drinks of course. The hotel had 5 different theme restaurants, where you can have for example Mexican, Asian or Italian food. On the other 5 days in Mexico we spend approx. 20€ per day and person. Due to the heat we had just a small breakfast and during the day only a lot of water. At night we always had dinner in a typical Mexican restaurant. In all restaurants the food was super delicious and we could try some typical Mexican dishes like burritos, tacos, avocado pizza, Mexican soups or nachos. 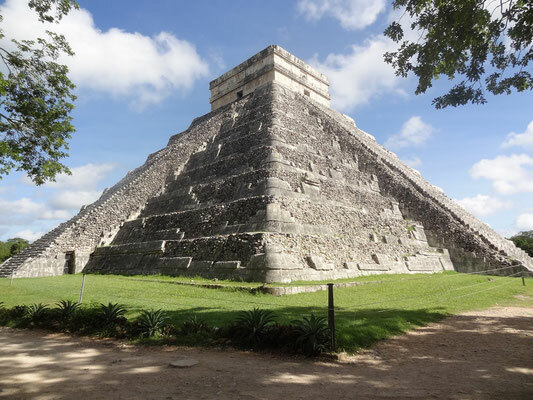 More information about our travel route and what we experienced in Yucatan can be found here: Yucatan - the perfect itinerary for 7 days. 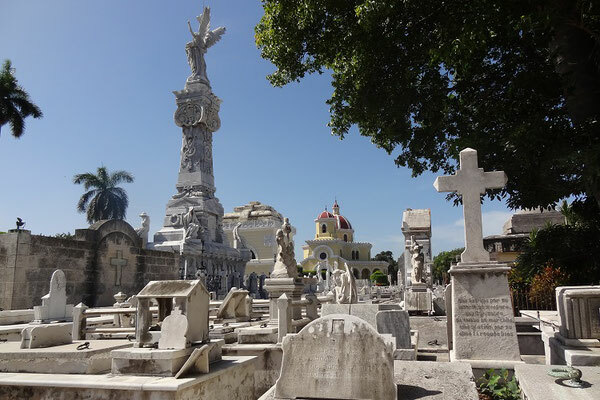 Our budget for our 2 weeks Cuba / Mexico (Yucatán) itinerary was less than 1.900€ per person. I'd love to visit Cuba one day. My partners uncle went recently and the photos were gorgeous! It's still a bit pricy for me though..
Hi, Maike! I love that you put all your expenses in the post. It gives a pretty good idea of the budget I need for it. One question: how safe are Cuba and Mexico? I mean, can I walk around with my camera, for example? Thanks! Cuba is super safe. We always felt safe even when walking around at night. We asked our host in our case why Cuba is so safe and she answered "first being criminal is illegal and nobody wants to have trouble with the police and second we don't have weapons". The route we took in Yucatan was very touristic and thus also very safe. I always walked around with my camera and never had any problems. I have been to the Yucatan a few years ago but would love to return again soon! great guide!